The South Fraser Blog: South of Fraser Light Rail Early Works Projects Started. Phase One to Open in 2024. South of Fraser Light Rail Early Works Projects Started. Phase One to Open in 2024. A few weeks ago, the provincial government and our region’s mayors came to an agreement on how to fund two-thirds of the largest investment in public transit for Metro Vancouver in recent memory. This agreement in principle, combined with federal government financial support, means that both the Broadway Extension of the Millennium Line in Vancouver and light rail in the South of Fraser are moving forward. The TransLink board will be meeting tomorrow, and one of the items on their agenda will be an update on the progress of South of Fraser Light Rail. 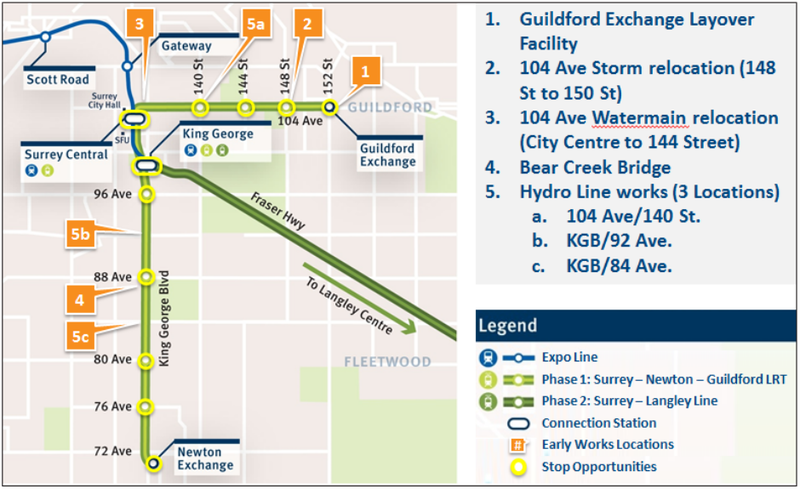 Light rail in the South of Fraser will be delivered in two phases. 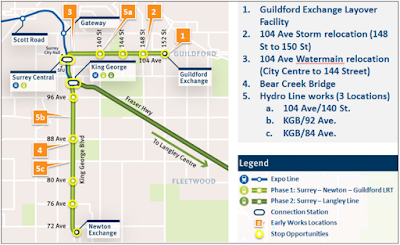 Phase one will see light rail operate from Newton to Guildford, and phase two will see light rail operating from Downtown Surrey to Downtown Langley City. For phase one of light rail, it is now expected that procurement will be completed this year, with construction starting in late 2019. Phase one is expected to start service in 2024. Various projects must be completed before actual light rail construction begins. These are known as “early works.” The following map shows projects that need to be completed. Map of phase one "Early Works" projects. Select map to enlarge. Each project is at a different stage of design, tender, or construction. One of the first projects to get off the ground is the replacement of the Bear Creek Bridge at King George Boulevard —just south of 88 Avenue— to support light rail. Getting rapid transit service within our part of the region has been a decade long process. It is encouraging to see construction work actually starting. I sure hope they change the plan for the King George/104th intersection. That is a guaranteed disaster worse than the recent NAIT extension in Edmonton. If they just pony up and grade separate that one small stretch it will improve the reliability and capacity of the whole line. If they leave the plan as is expect to see a lot of very unhappy moterists and eventually a loss of signal priority at that intersection...and an unreliable LRT.